The Lines and Geoglyphs of Nasca and Pampas de Jumana are the most outstanding geoglyphs in the world due to their size, number, diversity and long period of development. They are considered a magnificent artistic achievement of pre-Hispanic South America. The lines are located in the arid coastal plain of Peru. The hundreds of individual figures range in complexity from simple lines to stylized hummingbirds, spiders, monkeys, fish, sharks, orcas, llamas, and lizards. Their development spans 3 chronological phases between 500 BC and 500 AD. Many have been superimposed on older ones, with erasures and overwritings complicating their interpretation. For the most part, the technique used to create the lines was the removal of the gravel from the figure, providing a solid figure that contrasts with its surroundings. The geoglyphs were supposedly used as pathways for ceremonial processions. This is one of the few truly unique sights in the world. And also a place I have dreamt of visiting since I was young. 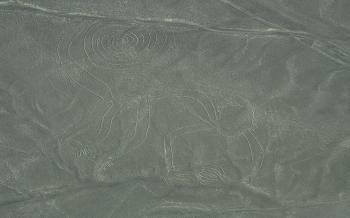 As it turned out, viewing the Nazca Lines is more of a total experience than just the visit of a sight. It’s the town of Nazca, quite touristy as it caters to the hundreds that pass by every day “just” to see the Lines. It’s the airport, where a dozen of companies offer nothing else than the same flight all day. It is the anticipation, waiting in the departure hall (Will my plane crash?, Will I be sick, Is it worth the hype?). It is the attitude of the large number of pilots walking around, even more showy and flirting than pilots in general. In the end, I did enjoy my flight. I had booked it the night before via the hostel that I was staying after having arrived in Nasca by bus from Lima at 21.30. My flight was with Aeroparacas, but I don’t think it matters that much which company you choose. I was put into a plane with 3 Koreans, one of which got all white and sick early into the trip. There's one pilot that navigates the plane, and a co-pilot that yells the name of the geoglyph you can see on the ground outside of your window. It takes one or two geoglyphs before it becomes easy to spot them and even have time left to try to take photos. They all pass pretty quick, I would have liked another round. I especially like the Whale and the Colibri. The Nasca Lines never featured high on my bucketlist. Yes, as a kid I had seen some of the pseudo documentaries asking (just asking, right?) if the locals hadn’t built these as landing strips for aliens. How else would such a remote, backwards tribe be able to accomplish such complex figures only visible from the sky? Being a WHS Traveler you learn to appreciate human ingenuity and the alien part wasn't really a factor for me. So I was wondering whether going to Nasca was worth the significant investment of time and money. As is often the case in these situations I consulted our community and a colleague and based on their feedback decided to go. I have to agree these Lines are special and it’s a special experience. Flying above the deserted landscape you suddenly start to notice all the different forms and shapes the locals itched into the landscape. It’s not just the figures you know, e.g. the birds, but also the simple huge geometric forms. As a caveat, though, I need to point out that this is a 30min experience. I think more or less all prices are the same. Expect to pay with all taxes and fees included around 100 USD for a 30min flight to the lines. There are also longer flight options available at higher prices. If you have your own transport you can probably haggle at the airport. But if you are relying on public transport and are short on time, I would just book ahead and reserve online as I did. With a reservation you will get a shuttle from Nasca town to Nasca Airport and back, so you don’t have to worry about that yourself. Being a solo traveler the airline shuffled my flight around a bit, but it all worked out. Seven years ago, and even worse when the Tanners visited, safety seems to have been a major concern. To this day (2017) you can find a travel advisory from Germany pointing out the risks of these flights. A major series of incidents took place between 2008 and 2011. I do feel this has been addresed. For Nasca these flights are their main source of income and it seems they take it seriously enough. Still, be sure to check your airline in advance and use a reputable airline with two pilots. I was a bit afraid of missing the Lines or having a bad seat. Lucky for me this wasn’t an issue. Our machine had two seats per row, so everyone had a window seat. All Lines are circled twice, once clockwise and once counterclockwise, so everyone can see them in full. In addition, the pilot rotated the plane in such a manner that the wing more or less pointing directly on it. My picture should give you an idea. In reality the lines are way better noticeable than on a picture. The circling and rotating, though, are a bit heavy on the stomach. I would recommend skipping breakfast/lunch till after the flight. Nasca is a good stop if you are travelling by bus from Lima to Arequipa. Okay, good is a relative term here. It’s 7h to Lima and 11h to Arequipa. Not quite in the middle, but still better than doing the whole trip in one go. I opted for two afternoon bus connections arriving at 23:00h in Nasca and at 0:30h in Arequipa. Unfortunately, the sun sets really early in Peru (around 18:00h) and fast, so I only got a limited view of the landscape. Still, this was highly appreciated and I encourage you to take a westward (Pacific) facing window seat when you reserve. There are no plane connections to Nasca that I am aware of. If you dislike long bus tours, the only other option at significantly higher costs is to go to Pisco as a day trip from Lima. They offer flights from there, but these are pricier (I believe at least 100 USD more). On top, I don’t think it saves you all that much time with all the commutes. If you have your own transport I would get going immediately after the flight. The trip to Lima or Arequipa is a long one. If you are relying on public transport and have a few hours to kill between your flight at 8:30h and your bus at 14:30h, there are a few options well in foot range of Nasca. The Cantalloc Aqueduct shows the Nasca water management system with blow holes and channels. Nearby to the Aqueduct are the lines of Telar, giving you a closer look at how the patterns are itched into the ground. And for a traditional Nasca settlement you can go to Los Paredones at the outskirts of town. Expect a 2h hike or so. You can buy a combined ticket for all sites. I found Cantalloc and Telar quite illuminating. The ruins meanwhile were a bit of a let down. Interestingly, from the hills you notice that Nasca is quite green, a bit like an oasis. Be advised that Lonely Planet lists some of these sites as dangerous to walk to. During my daytime hike I never felt anxious and saw no reason why. Alternatively, you can take a cab or a collectivo or join an organized tour. When I planned to visit Peru, Nazca Lines was one of the must go place I put on the list to do; however, after discovered that the best way to reach the town of Nazca is to take the night bus from Lima or Arequipa which I really hate, so I almost decided to skip this place. Fortunately, that I found out that it is possible to have a day trip to Nazca from Lima via Pisco, so after price negotiation, Nazca was back to my plan. On Peruvian Mother Day morning, the driver had been waited for me at Lima Airport’s arrival lobby and immediately took me to Pisco by comfortable seacoast highway. With brief stop for toilet at the small town named Asia, it took 3 hours from Lima to Pisco. I arrived the empty Pisco Airport before noon. Then I directly went to small terminal for private airlines and discovered that there were about 20 Indian tourists waiting for the Nazca sky tour. It was an interesting experience to use small plane as all passengers had been asked to be weighted in order to calculate and seat everyone and balance the whole plane. My flight was about 10 persons including two pilots, I was lucky to sit at the end of the plane next to exit so I had a very large legroom in such small plane. The flight from Pisco to see Nazca lines took around 30 minutes, then captain started to fly lower and informed us to see the famous Nazca lines. The experience was very fun as the plane has to fly up and down in circles in order to let all passengers in different side of the plane to see the lines. Captain always started with “On the left/right! On the left/right! Look at the shadow of the plane...1...2...3…that’s the Monkey/Alien/etc.” I felt like I was on roller-coaster while sightseeing and no surprised! Two passengers had airsickness and vomited. 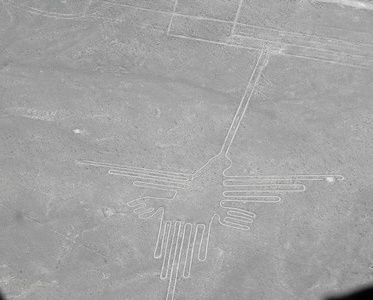 I have nothing to say about Nazca lines as they are the real wonder of ancient civilization, but I was a bit surprised to discover that they are actually quite hard to notice and see the lines even from not too high sky, so the theory of creating these lines for alien to see, for me is questionable. 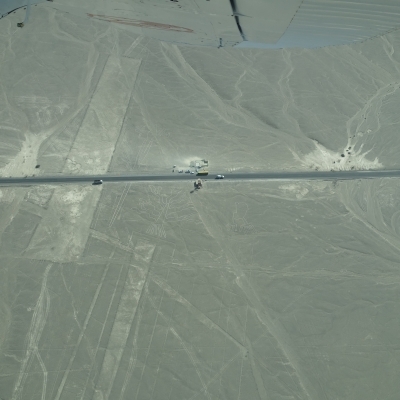 While Nazca lines are already a great sight, the experience from flying was even more fantastic, but again it was really depended on each person’s ability to handle small plane and spiral way of flying! But there is no alternative way to see the lines so bear it and have fun. From the air the figures look pretty small, but if you want to see how big they are you can go to the lookout tower on the highway just outside the town. From there you can see the "hands" and "tree" figures that are right next to the highway and from this close you can see how big the lines really are. No visit to Peru would be complete without over-flying the Nazca lines – I won’t describe the Lines or provide a photo of them as there is so much on the Web/in guide books about them. Instead those intending to take a flight might be interested in the attached photo from our visit as long ago as 1984. 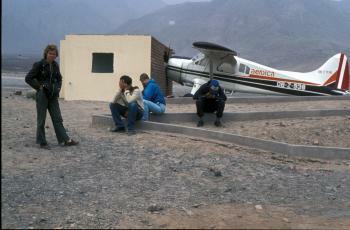 On arrival at the town of Nazca you have a number of different flying companies to choose from. In theory prices are “fixed” but, depending on the season etc, it is quite possible to shop around on the evening before and get both a “reduced fare” and a reasonably firm flight departure time. We chose Aeroica. At the airport (a rather grand term for what was an airstrip then - it may be better now!) planes are doing continuous take off and landings for the 40 minute flights. The engine on our plane wouldn’t start with the turn of the propeller from the (ageing!) ground-staff so the pilot got out and did it himself. He was, however, unaware that the chocks had been removed and, with the engine successfully started, the plane started to trundle pilot-less down the runway full of passengers! Various bystanders hung onto the tail and tried to stop it but succeeded only in turning it so that it crashed into the “terminal building”! There were no injuries so this result was no doubt better than some possible alternative outcomes! Now Aeroica still flies “the Lines”! Its Web site has rather pleasant Peruvian music and a nice map of the Lines together with a prebooking feature. Even this particular De Havilland Beaver plane must have been repaired as there is a “planespotter’s” site on the Web with a photo of it (same number!) dated 23 March 1986. We did fly that morning – although my wife refused to go in a different plane from myself on the basis that it was better if both of us died together! Whether the “unsafe” practice adopted by the pilot (I wonder happened to him!) was typical of other safety concerns and whether all such issues have been fully rectified I know not. But it is a GREAT trip – a lot of tight turns so, if you get airsick, you will on this flight! Arrange a (licensed!) taxi out to the airstrip and allow time to see the other sights on the way such as the Cemetery. I have some rather disturbing photos of desiccated bodies sitting in the rainless desert where tomb robbers had left them – hopefully the Peruvian authorities have got control over this now. Fatal Accidents or 'disasters': Seven tourists died in a plane crash while viewing the Lines (feb 2010). Five tourists had suffered the same fate in april 2008. Discovered from the Air: "were first spotted when commercial aircraft started to fly over the region within the late 1920s. Some of the passengers reported seeing some sort of pictures on the desert surface below."